Welcome to the new SPACE.com. 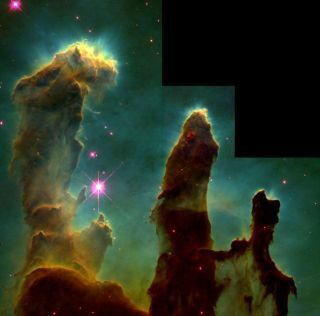 Here, take a look at the Hubble Space Telescope's iconic view of the Pillars of Creation in the Eagle Nebula. Since our launch in 1999, millions and millions of people have joined SPACE.com on a journey to the great beyond as we report live on launches, bring you 24/7 coverage of spacewalks and robotic missions, describe discoveries from astronomy conferences, chronicle the developing private space revolution, and share in the excitement of meteor showers, eclipses and other skywatching events. We’re a bunch of space geeks and science enthusiasts, and we’ve been having a blast. Now we’re going to kick this whole mission into high gear. Over the past year, we’ve hired additional reporters and support staff and expanded our coverage of the changes at NASA, the future of commercial spaceflight, military space, astronomy and science, and what’s up in the night sky. More people than ever are visiting the site — 5 million in December alone. And we’ve been listening to you. We know you want bigger pictures and more of them, broader coverage and more analysis. And we hear loud and clear that many of you want to be more involved in the conversation. So we’ve redesigned the site with all this in mind. We sought formal input from a handful of longtime participants in the SPACE.com community and factored in the many requests that have rolled in over the years. We’re extremely excited about the new features, improved navigation, and the overall new look. Additional features will roll out in coming weeks as we devote ongoing resources (IT and design people) to continue improving the site’s look and functionality as our reporting also expands. Join the Conversation: The new design gives community and social networking functions greater prominence and allows easier access to our writers. Facebook, Twitter and other social media will play bigger roles in our overall effort to deliver information to you wherever you are. Bigger photos: No single reader request has been repeated more often: “Please give us bigger photos!” We’re excited to make this happen. More Infographics: Words are great, and we love images. But sometimes the best way to explain things is with explanatory infographics. Not only are we pouring more resources into making them, but we’ve set up an easy-to-find archive so you can peruse them all. New Wallpapers: It’s been ages, frankly, since we added new wallpapers. We’re going to get serious about offering up new ones all the time now. More Night Sky Features: Whether you have a huge telescope or just like to go out and look up now and then, we've ramped up our skywatching coverage, with our own growing staff assisting our two weekly columnists — Joe Rao and Geoff Gaherty — to explain what’s up there and how to find it. More Insightful Coverage: This week’s series of articles on the argument for and against going to the moon is a taste of what our new, larger team can do. As we do a better job reporting the news, we’ll also be digging deeper and analyzing the big picture of the space program, both public and private. Also in recent months we’ve added copy editors, producers, an infographic artist, and beefed up our video production team.We also enjoy contributions from a host of talented freelance writers, including longtime Space Insider Leonard David, who has been writing for us since 1999. We're bullish on space. And while the new design aims to showcase all the content, we’re mindful that you count on SPACE.com for professional, quality journalism and serious analysis of the issues, plus some fun. With this new design and additional improvements ahead, we all pledge to make SPACE.com’s content better than ever, as we rediscover of our old slogan: Something Amazing Every Day. UPDATE: Several long-time visitors have complained that the new Comments function doesn't allow signing in via the old SPACE.com logins. We are looking at a possible solution to restore that capability, but we're not certain yet if we can. We're also working to improve some other aspects of the new functionality, and we appreciate all the suggestions. Comments? We’d love to hear from you below, or you can e-mail the Managing Editor here.